Bouncians have invaded from the furthest depths of space! Earth’s only hope is the Shot, a starship secretly developed for this very contingency. But the Bouncians have countered by enveloping Earth with their own Bounce Barrier, a wall that can deflect anything, even the Shot’s own bullets! Think you’re smart, huh, you sneaky aliens? Well, guess what? We Earthlings can use your bouncy wall just as easily as you can! In this game, your mission is to destroy the attacking Bouncians in the skies over Earth where the Bouncians have erected their Bounce Barrier. The Bouncians are slowly descending to Earth’s surface; you must dispatch them all before this happens! 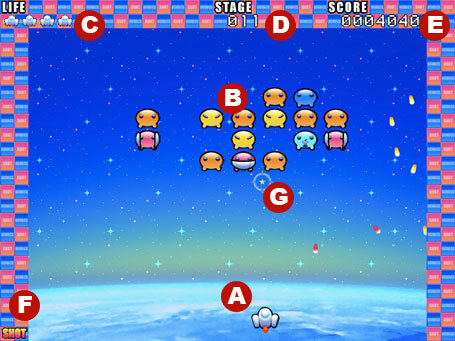 Each stage is bounded on the left, right, and top by the Bounce Barrier. When bullets fired by the Shot or by Bouncians hit the barrier, they rebound in a different direction. Using this behavior to your advantage, you can attack the Bouncians from all angles. Of course, the Bouncians themselves will also be firing in all different directions, so you better make sure you’re not caught off guard by a bullet from an unexpected angle. The Shot will move left or right following the target cursor. The faster it moves, the farther it tilts. If you fire while it’s tilted, your bullet will travel diagonally. Click the mouse button to fire. Some Bouncians carry explosives. If you shoot one while it’s carrying them, the explosives will detonate and take out nearby Bouncians as well! If another explosives-carrying Bouncian is caught up in the explosion, it will detonate in turn. Chaining explosions can net you a large point bonus! The Shot will blow up if it is hit by a Bouncian’s bullet or by one of its own that has reflected off the barrier. If you run out of lives, or if the Bouncians reach Earth’s surface, the game is over. A super combat starship, the fruit of all mankind’s scientific development. Despite possessing only one solitary jet, it can miraculously move left and right at will. It’s also equipped with a high-tension mechanism, so as the number of bullets that can be fired simultaneously increases, their speed also goes up. A frightening, amorphous creature that slowly advances with an expressionless face. Its empty eyes desire only one thing: the utter destruction of Earth. Sinister. A knight-class Bouncian, it attacks the Shot from behind a shield. The shield is impervious to the Shot’s bullets, so you need to attack it from an unprotected angle. Horrifying. A monstrous engineer-class Bouncian that plots to sneak a cataclysmic bomb onto Earth’s surface. It bears down on the Shot while alternately brandishing and hiding its explosive. Chilling. A bio-engineered soldier that can absorb more than one bullet from the Shot and continue its attack. The experimental surgery may also be responsible for its brutal gaze that unnerves even its fellow Bouncians. Ghastly. Click the START button on the title screen to start the game. You can also see the game credits by clicking the STAFF button or view the high score rankings by clicking the RANKING button. If you enter a username on the title screen, your score will show up in the high score rankings — if you place high enough! Use the mouse to move the target cursor. The Shot will swerve left and right to follow the cursor. Click the mouse button to fire in the direction of the cursor. The number of bullets you can have on-screen simultaneously is indicated by the Max Bullets display. You can increase this number by collecting power-up capsules. 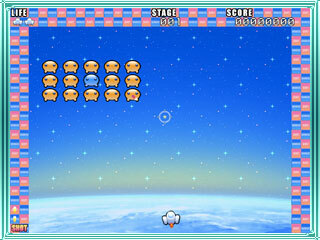 To get power-up capsules, watch for a Blue Bouncian that flashes white at the beginning of each stage. Shoot this Bouncian while it is holding its explosive, and a power-up capsule will appear.You can have up to eight bullets. The more bullets you get, the faster they will fly. The Bounce Barrier will deflect bullets both from the Shot and from Bouncians. You can use this to your advantage and attack Bouncians from the side or from above. Getting hit by a bullet will cost you one ship. You have to avoid both the Bouncians’ bullets and your own that have rebounded back toward you. The Bouncians float from side to side, turning around when they hit the Bounce Barrier and slowly descending to Earth. If they reach Earth at the bottom of the screen, it’s Game Over. Destroy each Bouncian formation before it reaches Earth! Eliminate every Bouncian on the screen to advance to the next stage.